Managing the home and large family chores become a simpler task when you include the children. Having a large family means learning to work together as a team. “Many hands make light work” is definitely something that has rung true in our family. Every family operates differently and that means that what works for us may not work for you. However, there are some things to do that will help you determine the best routine for your family. I will walk you through my thought process for developing a daily routine for large family chores. Keep in mind that my seven children are all under thirteen. As an example, you can read the 6 Daily Chores That Must Get Done at our house, in order to keep our house running smoothly, looking tidy, and functioning fully. It has been a great foundational routine for us for years now. And I know you can develop a daily routine for large family chores, too! Think of your family’s typical daily routine. How do things flow naturally throughout your day? What happens first thing in the morning? What happens in the middle of the day, afternoon, and evening? Now, decide which household chores that must get done during each timeframe. There is no reason to come up with a brand new schedule and routine for your day. Simply think of how your family lives life and what tasks you know need to get done each day. Create a morning, afternoon, and evening chore chart or list. Simply doing a quick brain dump on scrap paper is even helpful to start! Then choose your top chores that must get done each day and write them all down in each section. It doesn’t need to be pretty or organized, you are just prioritizing at this point. Now is a great time to ask for your husband’s input. Are there any specific tasks he’d like to see done each day? It helped me to know that my husband wanted at least one side of our kitchen sink empty when he got home from work so that he could easily wash his hands, rinse out his thermos, etc. Also, he wanted the floors to be clear of toys so that he wasn’t walking through a maze or completing an obstacle course just to get through the house! It may look something like this: Breakfast & clean up, laundry, empty garbages, lunch & clean up, pick up toys & vacuuming, supper & clean up, dishes, bedtime routine, etc. Of course, this will look somewhat different for each family! If you are starting with little to no daily chores assigned to your children, then you will want to start small and think of just one chore to assign to each child. Toddlers can be assigned simple tasks, too, so be sure to include them. Age-appropriate chores can be found online, but you know your children best so determine the best chore for each child. Guide them through mastering their task with some variation of the following steps – not every chore needs these steps: 1) They watch you complete it while you give detailed instructions. 2) They help you complete it. 3) They complete it with your help. 4) They complete it with your supervision. 5) They complete it on their own and then you give an inspection. For most children, a new “job” is exciting. They love being part of the “family team” and will be anxious to help. Maximize on their enthusiasm early on and be sure to give them a lot of praise for their efforts! Once their chore becomes a habit, consider adding another chore or “promoting” them to a more difficult task. Once you have decided on your daily routine for large family chores, make them visible to all family members! I love having my list up on the fridge or on my kitchen wall where everyone can see it easily. You can simply type it up on the computer or use a whiteboard. I have a whiteboard calendar that I have adapted for this purpose and it is on my garage door in the kitchen. It also includes our meal plan, homeschool routine, and my work schedule. You can either just create a simple paper list/chart or buy a chore chart. Having the assigned chores and daily routine planned and written out helps everyone stay on task. You will be able to easily remember which chore each child must do. It helps that it is not a schedule with time slots, but rather a routine that simply creates some order. Just do the next thing on the list! Flexibility is key to large family life, but creating good habits and providing a structure through routines are also important! Every few months, with every new season, or whenever makes sense for your family, you should revisit your daily routine for large family chores and adjust as needed. 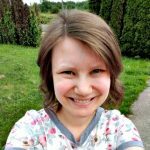 I like to start our homeschool year with a fresh chore list and new chores for my kids to learn throughout the coming school year. Creating a routine for large family chores takes a little extra time & effort up front, but when your children are completing their daily chores out of habit with little whining, you will be so thankful for the investment! 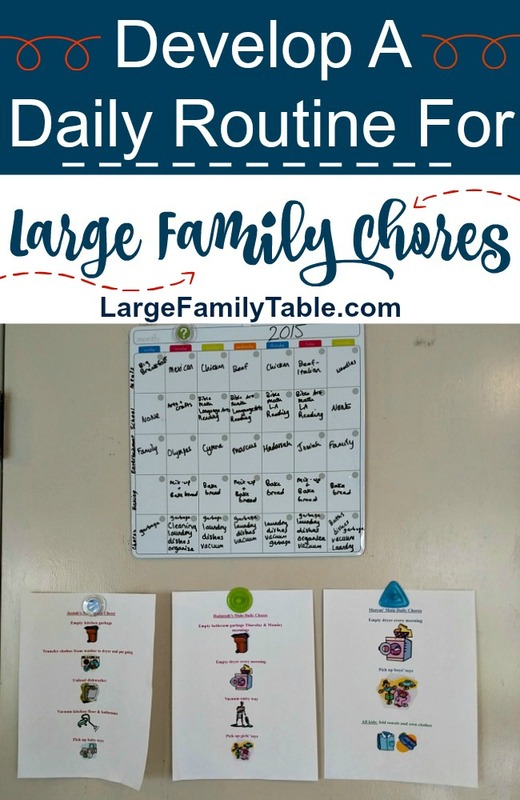 Next, you can use the same steps to develop a weekly, monthly, and yearly routine for large family chores! My Annual Planning: Family List Making Guide can help!